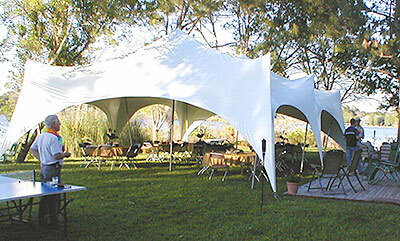 All canopy rentals include set-up on grass, takedown, and removal. Many styles and sizes available. Scroll down for more. Elite Party Canopies by Eureka! From Johnson World Enterprises, the computer designed and patented Eureka! 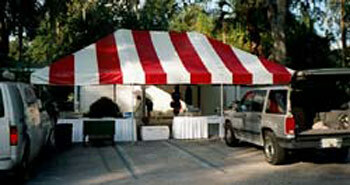 line of canopies are the industry leaders for private parties and corporate social events. 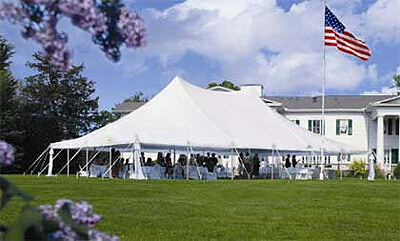 All sizes are available with white tops and poles for weddings, receptions and other elegant occasions. 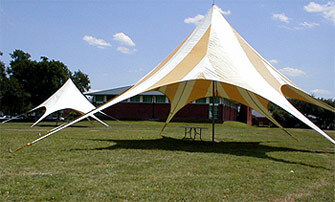 Very large party and sales event canopies also available. Please call for a competitive quote. Special rates for weekly rentals available. Capri Party Canopies by Eureka! A striking modern sculptured canopy with large arched entrance ways. Winner of Outstanding Achievement Award from the Industrial Fabrics Association International. Solid white in color. Suggested for use on patios and decks. Features an open interior area without center poles. Side Pole Leg Extensions are adjustable from standard 7' height up to 9'6''.Allows level set-up on multi-level surfaces. Promotes higher visibility at sales events. No Additional Charge. Festive Star shaped canopy sets the mood for any party and attracts lots of attention to special sales events. The center pole is a full 19' 6" high with each of the six arms of the star extending out 25 feet from the center, creating a GREAT PROMOTIONAL ATTENTION GETTER and gathering place. 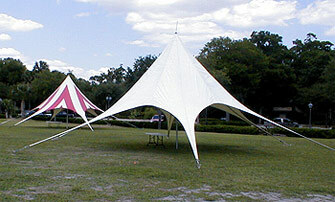 Canopies are available in solid white, red and white, and yellow and white. Please note that there is a 29' radius requirement for each arm of the star. A flat, open, 60' x 60' area is required for installation. This is our only canopy available for rent "over the counter". The top stays attached to the frame for easy set up in 60 seconds or less with no assembly needed. 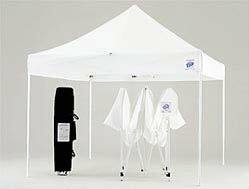 The solid white polyester top is water resistant and meets CPAI-84 fire retardant requirements. Comes complete with carry bag and hold down weights. Please note that delivery is not included at this special price and a $200.00 cash deposit plus the full rental fee is required at the time of pickup. Delivery is also available. Need Tables or Chairs ?